King’s College accepts applications from qualified native speakers. We require a university degree plus TEFL certification, usually at CELTA* level. Teaching experience is a big plus, especially experience of teaching children. An important asset, much valued in Thai culture, is a cheerful disposition. We very much want people to have a rewarding and fun time working with us. Professionalism is a must. A copy of our policy document accompanies our contracts. You will see that Thais set great store by a neat appearance and punctuality and that we aim to maintain a high standard of excellence in the teaching we offer. The school will send the necessary documents from Thailand to your nearest Thai consulate to obtain a ‘non-immigrant B’ visa. You need to download and complete an application form and send it to the consulate by post together with your passport, passport photos, and fee. 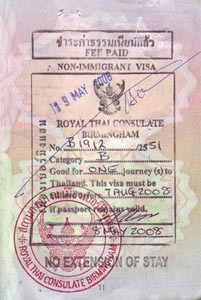 The visa is usually issued in a day or two, and you are entitled to travel to Thailand. On arrival the school ensures that your work permit and teaching license are issued by the appropriate authorities. You will need to make sure that the documents you present ALL have exactly the same name as it appears on your passport – including initials and first names. If there is a discrepancy you will have to contact your college or get a certification from the embassy in Thailand. All teachers MUST have a bachelor’s degree and a 4 week CELTA, Trinity College TEFL Certificate or similar, 120 hr course of which is NOT AN ON LINE COURSE with evidence to support this. You will be required to produce original degree and TEFL certificates on arrival in Thailand as these are required by the local authorities when processing your work permit. Teachers without degrees should not apply. HND’s are not accepted in place of a degree.